### Start times can vary by up to 30 minutes either way, depending on the logistics of the day. As we offer a fully mobile service and meet at various locations, some flexibility may be required ;-) Thanks in advance! ### BMB self guided tours and hire require minimum numbers for the day to go ahead. The booking system will send a pending order email confirmation upon your online booking. When minimum bookings are received, bookings/rides will be automatically confirmed. Regardless of whether ride goes ahead or not, you will receive a call from the owner (Sam) the night before your ride to confirm the status and info about the ride and logistics. Rides that do not go ahead will be instantly refunded or you can choose another date and the booking will be moved...whatever suits you best! The above is not totally inflexible and Sam will help, with pleasure, where ever possible. 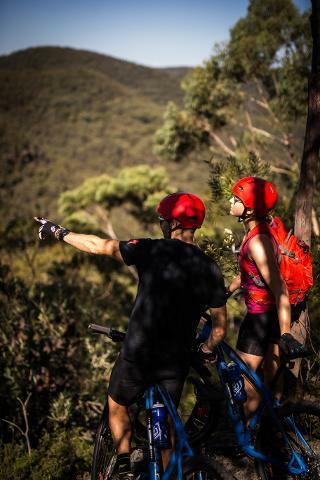 Included: Mountain bike hire includes bike, helmet and maps. You can expect your ride experience to last from 2.5 to 4 hours. A winding, 'edge-of-the-world' drive around the cliff-tops, packed full of lookouts, picnic areas and walking tracks, and right beside lots of galleries, cafes and gardens. Highlights include Echo Points 3 Sisters and Sublime Point. 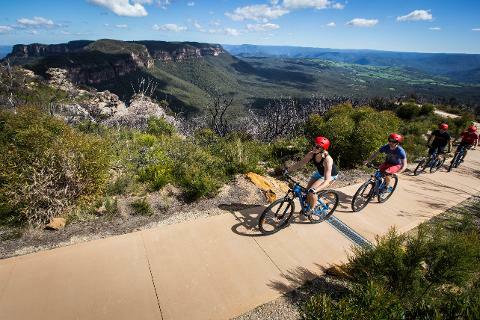 Begin on the western side of Katoomba, at the northern end of Narrow Neck Road. 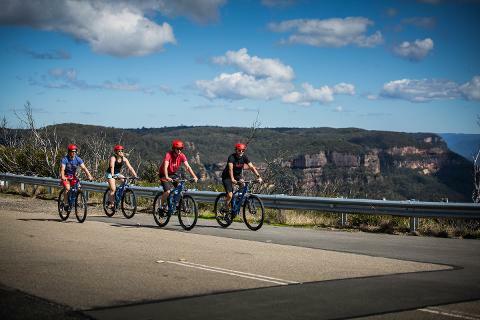 Travel south on Narrow Neck Road and turn right into Cliff Drive, following it round to Cahills Lookout, back out to Narrow Neck Road and round to Narrow Neck Lookout. 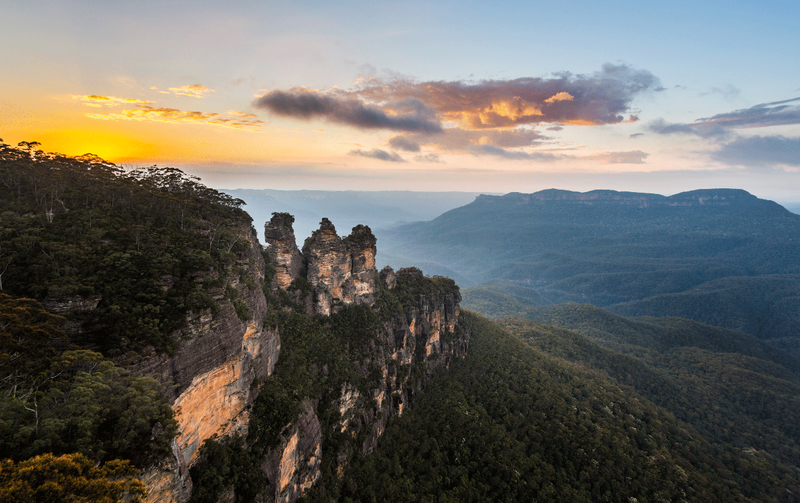 A drive along Narrow Neck via Glenraphael Drive is a scenic diversion, or continue along Cliff Drive to Hildas Lookout, Cyclorama Point and Scenic World. 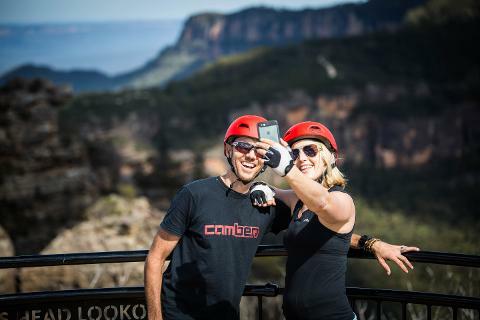 The next stop is Katoomba Falls Picnic Area, a trackhead for the walking track network, then Echo Point with the visitor information centre and the famous view to the Three Sisters and Mount Solitary. Cliff Drive proceeds round the edge of the bush, past Silver Mist Park and Honeymoon Lookout to Leura Cascades Park - another walking trackhead. Cliff Drive ends soon after. Turn left into Leura Mall then right into Craigend Street and follow the signs down Sublime Point Road to Sublime Point. 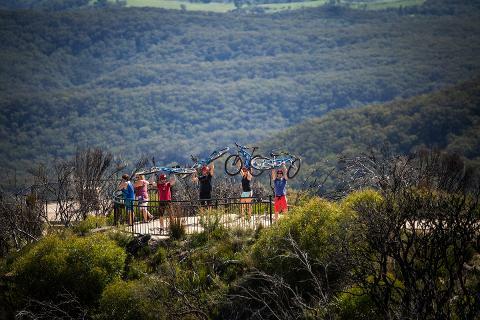 Cancellation by Blue Mountain Bikes Australia due to weather: Ride rescheduled for another time. Cancellation by customer 8 days or more from ride date : Full Refund no questions asked. Cancellation by customer 7 days or less from ride date: No Refund. Request change of date 8 days or more from ride date: Yes. This is not your typical basic bike hire business. This is a premium mobile service that offers you a self guided ride experience. Safety is paramount as obvious by the quality modern equipment used. You are met with your bikes ready to go near the start of the trail/ride. Sam (the owner) spends 30 minutes with you as he personally fits you to the bike and helmet, runs through bike operation, trail information and provides you with some riding skill and technique tips to help you get the most out of yourself, the bike and the trail. ### Team bonding and corporate days also available. 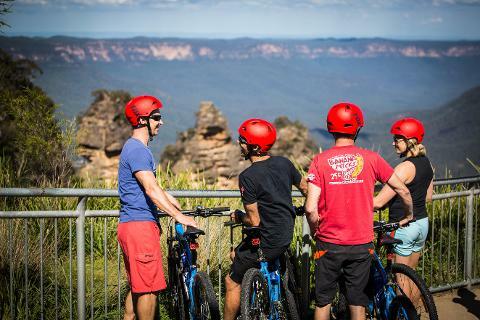 We put together multi adventure day or days including activities such as biking, hiking, camping, kayaking and much more. Please contact us to discuss your dream team experience. ### See a day that is not available, feel free to give us a call to see if we can help out.